Fox News is once again moving to the left, hoping to avoid left-wing attacks on its news operations and commentators. But the move risks alienating conservative viewers. The current controversy involves new Fox News contributor Santita Jackson, who lists the notorious Rev. Jeremiah Wright, Jr., as being among her personal “activities and interests” on her Facebook page. Wright, who was Obama’s pastor for 20 years and baptized Obama’s children, became a major controversial figure during the 2008 presidential campaign when it became known that he blamed the 9/11 terrorist attacks on American foreign policy and claimed the U.S. manufactured the AIDS virus to kill black people. The link on the Santita Jackson page, which promotes matters of personal interest to Ms. Jackson and other things she likes to do, directs people to Wright’s official home page. Santita Jackson praised Bell’s decision to leave Harvard in the context of criticizing Obama’s decision to appoint white feminist Elena Kagan to the U.S. Supreme Court. Kagan’s hires “while serving as law dean at the Harvard Law School have served to give me pause,” she said, noting the reported failure to hire one single African-American, Latino or Native American. “NYU Law Professor Derrick Bell left the Harvard Law school in 1992 over this very issue,” Jackson noted. Equally significant, Jackson’s bio describes her as a founding contributor to The Grio, a website dedicated to black news and opinion owned by MSNBC and which is produced in cooperation with NBC News. She lists The Grio as being among her other activities and links to a description of the site. Hence, Fox News is sharing personnel with a rival network, another indication of the channel’s move to the left. It is apparent that the left-wing attacks on Fox News, many of them directed through the Soros-funded Media Matters group, have taken their toll. It is not known if Fox News understood that Santita Jackson, in addition to being the daughter of left-wing activist and Democratic Party politician Jesse Jackson, has been promoting Jeremiah Wright or Derrick Bell. Fox News host Sean Hannity frequently talks about how he used his program during the 2008 campaign to expose Wright and his influence over Obama. Santita Jackson’s “interest” in Wright, a form of expressing support for the controversial minister, can only add to concerns that Fox News is moving to the left so fast it is not checking out its left-wing contributors. Her praise for Bell is equally dismaying. More than two years ago, Fox News hired—and then fired—Marc Lamont Hill as a paid commentator, after AIM revealed that he had an easily documentable record in support of cop-killers. Santita Jackson comes from Chicago, which is Obama’s home base, and hosted a radio show on Chicago’s WVON, which just happens to carry a show by the notorious Al Sharpton. Next to Sharpton, who hosts a TV program on MSNBC, her father may be the most vocal race baiter and agitator in the nation. Sharpton promoted the Tawana Brawley hoax, in which a black woman falsely claimed being raped by white men. Sharpton and Jackson have both been quick to jump on the Trayvon Martin shooting, in order to promote the idea that America is a racist nation in which blacks are profiled, shot and killed for no reason. However, facts emerging in this controversial case demonstrate that the shooter, George Zimmerman, a Hispanic, may have shot and killed Martin in self-defense, after a violent confrontation, and that Martin, a black teenager, had been in trouble at his school and suspended. Investigations into the case continue, although the use of lethal force in self-defense is permitted under Florida’s “Stand Your Ground” law. Although she is going to work for Fox News Channel as a paid contributor, Santita Jackson has never said anything on the public record that is complimentary to the cable channel. Hence, the hiring looks like a sop to the critics of the cable channel. Even more embarrassing for Fox News, her Facebook page identifies liberals Anderson Cooper and Roland Martin of CNN as being her favorite media personalities. She and Martin are long-time friends. One other reader comment at The Blaze was that if Fox News keeps moving left, it will start resembling CNN. Although her left-wing political views are nothing new, and only add to what Greene and Kohn already provide on various Fox News programs, there is no doubt that Santita Jackson has a fascinating personal story. She lost more than 200 pounds after gastric bypass weight-loss surgery. She is also said to be a dynamic singer. She sang at President Clinton’s second presidential inauguration and attended Obama’s inauguration. But her political views, of course, are what are getting attention since her hiring by Fox News. In addition to being a fan of the anti-American Rev. Wright, her Facebook page lists the radical demagogic Catholic Priest Father Michael Pfleger as one of her favorite interests. Pfleger, who has known Barack Obama since his days as a community organizer in Chicago, called on Christian churches on March 25 to put a hoodie on their altar as “a sign of solidarity” with Trayvon Martin, the black teenager who wore a sweatshirt with a hood before his confrontation with Zimmerman. During the 2008 presidential campaign, Pfleger was hailed as “a friend” of Wright’s Trinity United Church of Christ and declared in remarks from the pulpit that Hillary Clinton thought she was “entitled” to the Democratic presidential nomination because she was white. Tamara Holder identifies herself on her Twitter page as a lobbyist and “government consultant” but does not disclose who she is lobbying or consulting for. 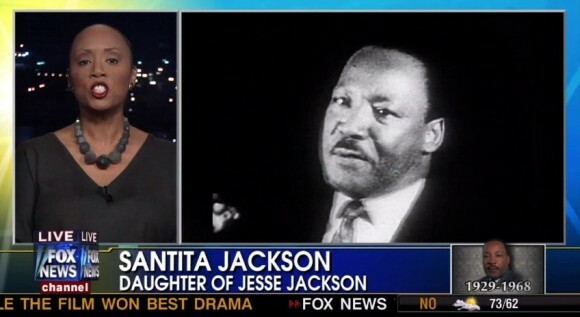 The Santita Jackson show has now moved from radio to TV, courtesy of the Fox News Channel. Is her father next in line for a show on the “conservative” channel? We haven’t watched FNC since Beck’s departure last June, at which time we were thinking they were already pretty liberal.